The auto-latch is unique in that all a person has to do is push, kick, bump, or otherwise impel the gate after him or herself, and it latches firmly and securely ...automatically! The auto-latch may be positioned in such a way that is more convenient than ever for adults to operate - while at the same time it is extremely difficult for a small child to open. View the Shop Drawings here. 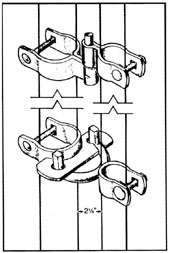 The gravity type self-closing hinge set has no springs to wear out. By raising the bottom hinge set you can increase the force at which the gate will close. The hinges can also be used to compensate for slight grade changes making it possible to install the gate on a hill, yet keep the bottom of the gate close to the ground. 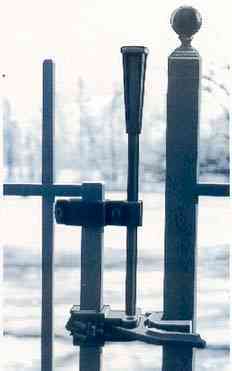 1 3/8", 2", 2 1/2", or 3" gate post. Same features and sizes as two-way except only allows gate to swing one way.